I love how seeing things on Pinterest can be so inspiring! And while I love looking at everyone’s different ideas, I’m not capable of simply copying the way that someone else has done it. I have to change it, tweak a little bit, make it mine. 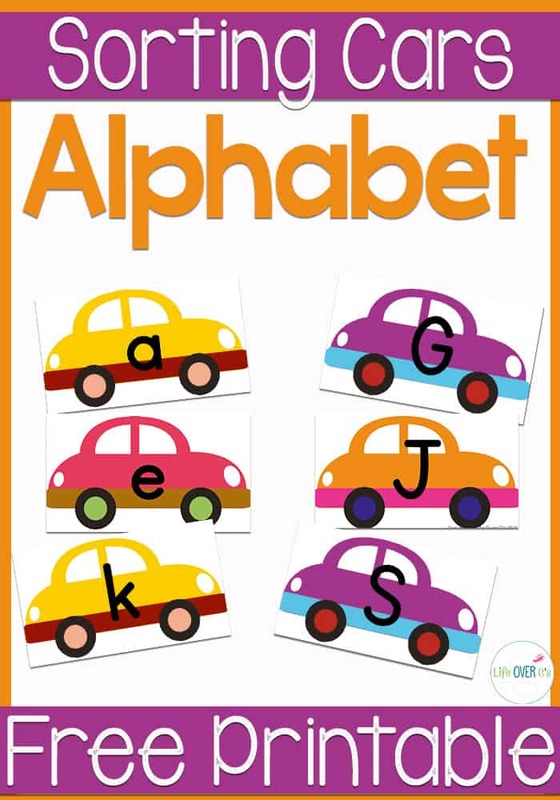 That is exactly how I came up with this idea for an uppercase/lowercase alphabet sorting activity. I saw this super cool post by Allison of No Time for Flash Cards. 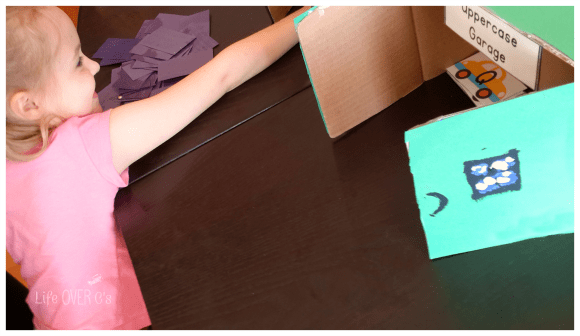 She used wrapping paper to create a really fun activity for her kids. 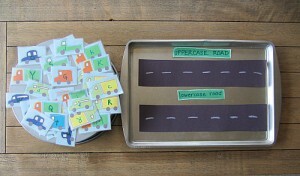 You can check out her Alphabet Road Sorting Game here. But when a follower on my FB page asked where she could find the wrapping paper, Allison let me know that she had gotten it at Target, but they no longer carry it. Boo. I asked Alison if she would mind if I made a printable that could also be used for her game and she gave me the green light! Yea!! 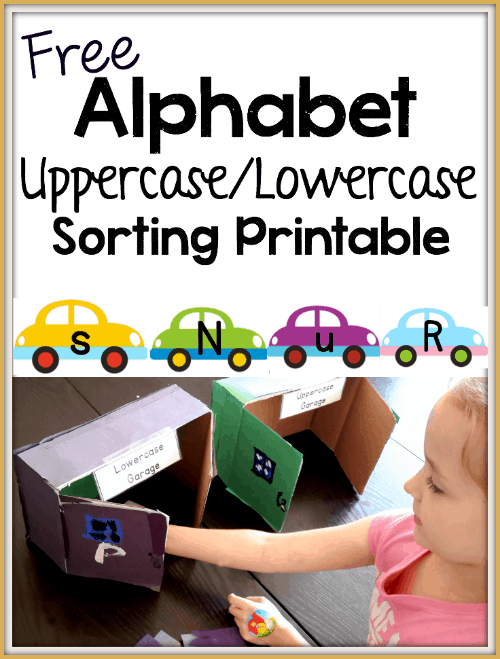 So today I put together this free alphabet sorting activity for you! Of course, I didn’t want to steal the awesome idea that was already given, so we came up with our own spin-off. Uppercase/Lowercase garages!! I took a box that used to hold a DVD player (small) and cut it in half creating two garages with the top flaps as doors. You could also use a cereal box cut in half, but you would need to cut open the front of the box to create the doors. The kids decorated the garages with some construction paper and little bit of paint. 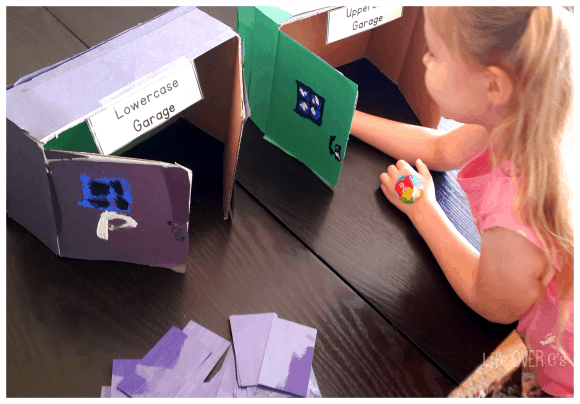 (Then got distracted making toilet paper roll cars…) We hung the uppercase/lowercase signs from the printable on the inside of the box so that you could see them with the doors open. Then, I gave Jaida the cards and she began to sort them. She also used it as an opportunity to say the name of each letter as she put it in the proper garage. And she got 100% correct! Now, I will say that Jaida is in 1st grade, so this was a review activity for her. If I were using it with a younger child, I would limit the amount of cards to sort at one time. These cards could also be used for playing Memory, Go Fish, or just a matching activity. this idea is so amazing , i just love it and want to try for my 21ms son who is only adore the cars.